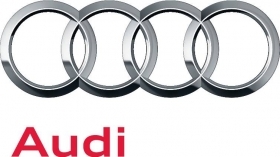 BERLIN (Reuters) -- Audi may reach its goal of selling 1.5 million cars a year earlier than planned because of demand from China, Germany and the United States. The Volkswagen Group premium brand had expected to reach its target in 2015. "The way things look at the moment, we may be able to reach this target earlier," CEO Rupert Stadler told Audi's annual shareholder meeting in Ingolstadt, Germany, on Thursday. Audi is vying with Mercedes-Benz, which it surpassed last year, to grab the luxury-sales lead from BMW by the end of the decade. Audi boosted four-month deliveries 12 percent to 471,300. BMW sales rose 10 percent to 478,030, while the Mercedes brand's volume increased 10 percent to 418,246. Audi may match last year's record operating profit of 5.35 billion euros ($6.92 billion) this year if economies don't slump, Chief Financial Officer Axel Strotbek said in a separate speech on Thursday, reiterating comments made previously. Audi's operating profit in the first quarter climbed 27 percent to a record 1.4 billion euros. Stadler said Audi is targeting double-digit growth in auto sales in China and the United States this year and expects European deliveries to at least match year-ago levels despite slowing economic growth in the home region. Audi intends to grow faster than the overall auto industry by introducing 18 new or refreshed models this year, including a new-generation A3 compact and a hybrid version of the A6 sedan. In April, Audi announced plans to open its first North American plant in Mexico, which will begin production of the Q5 mid-sized SUV in 2016. The plant is crucial to Audi's aggressive expansion plans in the United States and worldwide. Last year, Audi sold 1.3 million vehicles. BMW brand sold 1.38 million while Mercedes sold 1.26 million.